I write from Guaymas/San Carlos, two great fishing bays on the Sea of Cortez. Reading John Steinbeck‘s book, The Log from the Sea of Cortez, which details his tidal pool collecting journey in 1940, I was shocked to read of the Japanese fishing fleet that was working outside of Guaymas that year. I wonder about the sustainability of the Guaymas fishing industry today. Sport fishing includes marlin, yellowtail, bass, red snapper, sailfish, dorado, bream, salmon and perch. Locally, an estimated 80 percent of the rural population fish the lagoons. They fish for sardines, shrimp and squid. 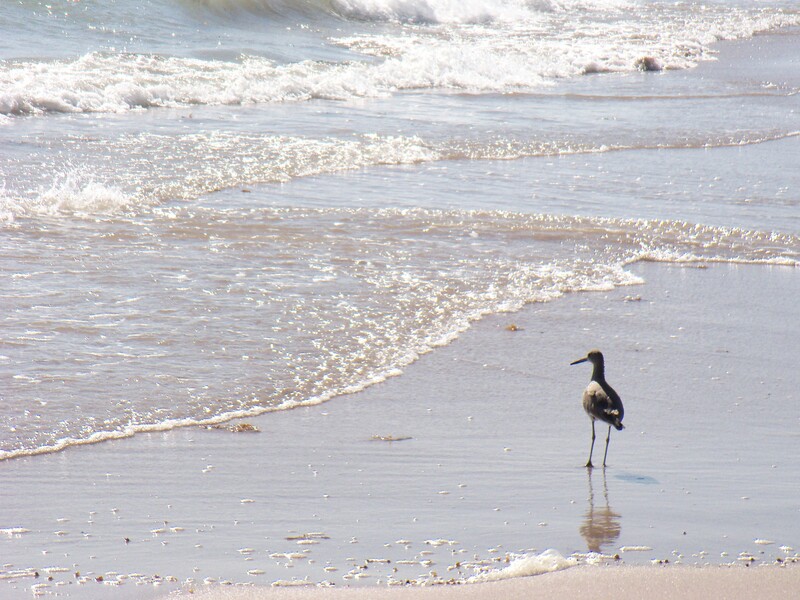 A sandpiper eyes the ocean but does not want to get his feet wet. In 1977 the Mexican government regulated mesh size. I also know that the shrimp stock is closely monitored and the Gulf shrimp season is closed between March and September. Looking at the charts and graphs published at the aforementioned website, I note that the catch seems to fluctuate greatly from year to year. As for me, we are eating seafood today. Hu.m.m.m.m.m. I’ll eat fish and hope that the Mexican government has their eyes on the statistics and their will on sustainability. 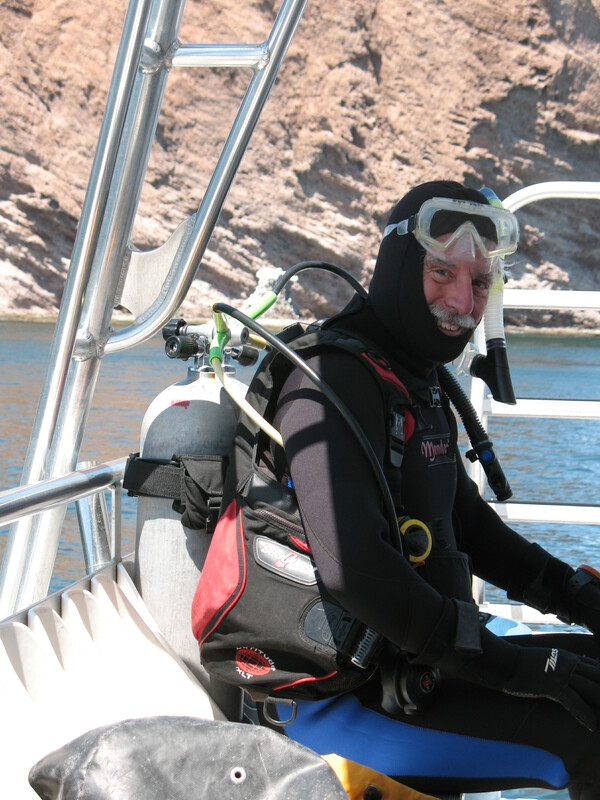 This past week my husband Mark has been diving with his favorite San Carlos dive guys at El Mar. The sea has been strange: pond-like placid one moment and carving up a new beach front the next. In the distance the sea is teal/gray, but as it comes to the shore, it kicks up sand and the water beneath the latte foam is brown. The sand and seaweed come in; the sand goes out. The seaweed remains. The sandpipers scoot on mincing, Gracie Allen feet. They’re shy as cats at getting their feet wet. Only the small silver fish will make them brave the water. Diving is murky at best. 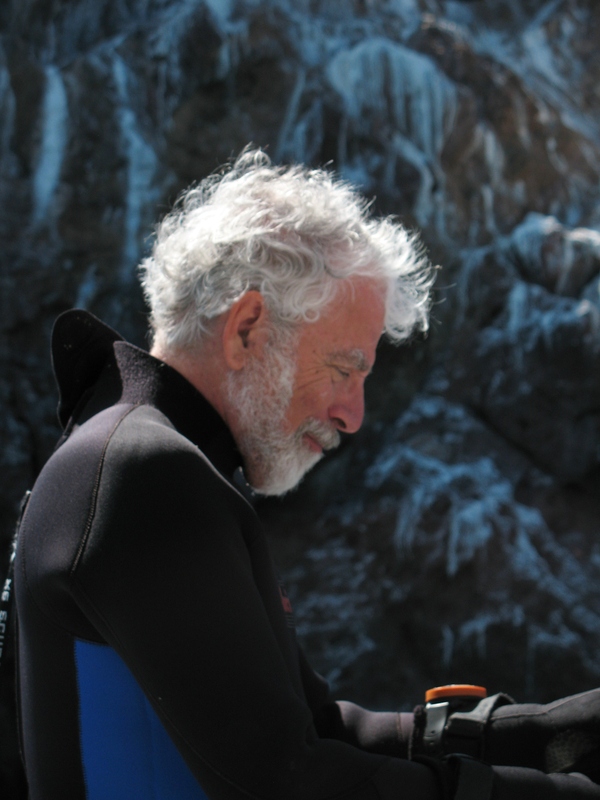 As Mark descends and the thermal properties of his dive suit compress under pressure, the temperature of the sea, a chilly 63 degrees, feels colder and colder. At 60 feet, visibility is nil. Mark compares it to the billion points of white, you experience driving into a blizzard. In the case of diving in the sea, what little light there is from above bounces off the zillion micro-organisms in the split pea soup. While Mark dives, I hang out hammocked in the waves of the boat at anchor. I watch the rocks. The most inhospitable in the world. I marvel that anything can grow on them. I find it annoying that amending the soil, fertilizing, and watering a plant at home, I have only a 50 percent survival rate at best. Half of everything I plant dies. 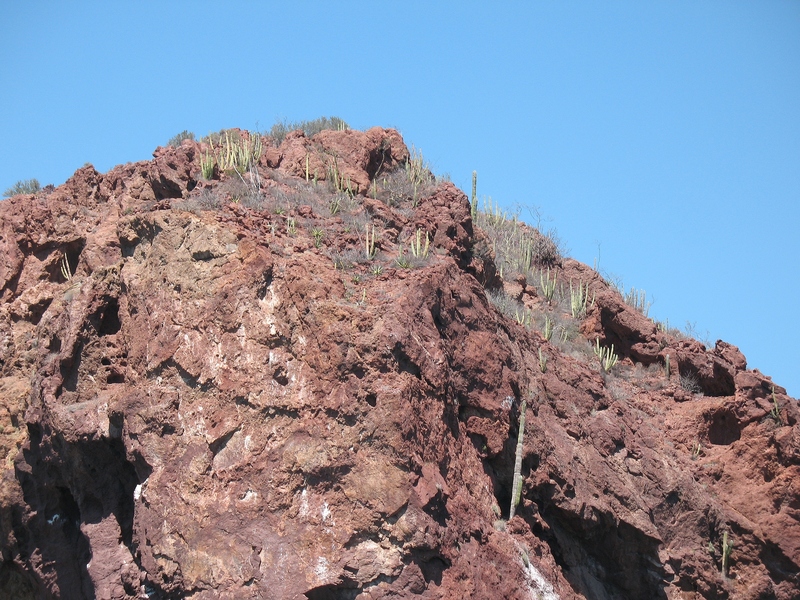 And yet, here… on bare rock we have some pretty healthy cacti. Pipe organ, agave, and saguaro to name three. Can’t imagine why Mark would want to dive into the dark. He was so disappointed that he only dove to 98 feet. Had wanted to dive to 100.